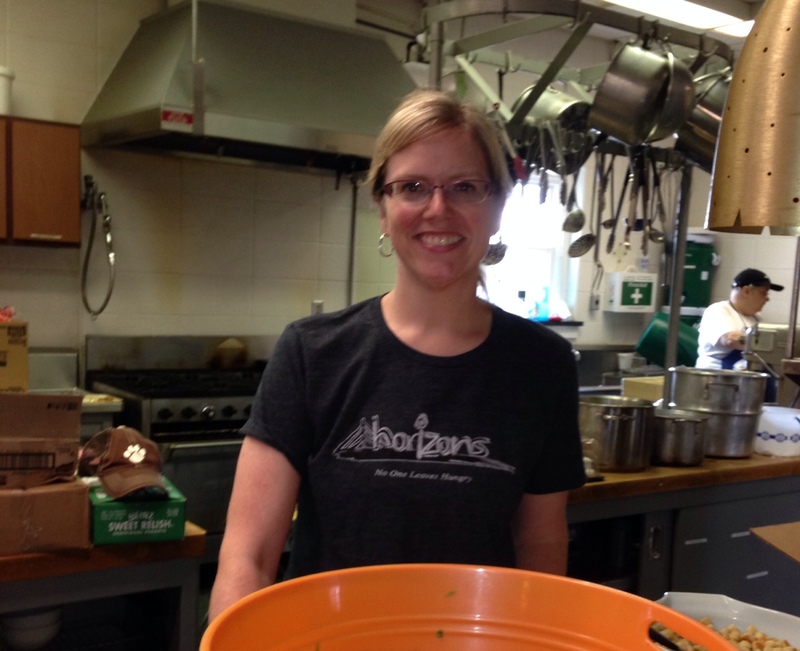 Horizons’ volunteer, Kristin Spear, from St. John’s Anglican Parish shares a heartfelt testimony and reflects on how volunteering at Horizons is a faith bolstering experience! 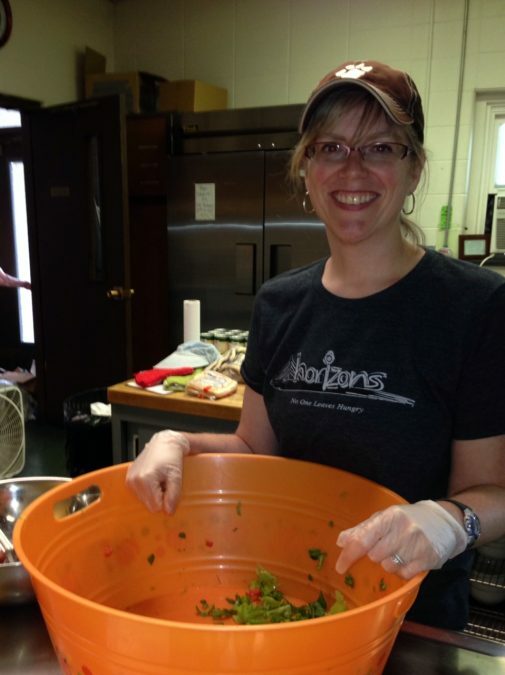 Why do you volunteer at Horizons? My life has been extremely blessed. I have a great and loving family who fostered my faith in God from a very early age. I have never been hungry or wondered where I would get food for my next meal. Sharing my blessings from God fosters my desire to volunteer at Horizons. Why does our community need Horizons? Feeding peoples’ bodies with nutritious food is an absolute necessity for life. Horizons adds to that mission by creating a safe, loving, and respectful environment to also feed souls which is also critical for Life. By sharing faith in Christ, Horizons builds people back up both physically and spiritually to be able to walk again along a good path and create a positive future for themselves and their families. Can you share a Horizons experience that is especially meaningful to you? I don’t have a single experience to share, but I see the Spirit filling people as they share their time and their love of Christ. I see both volunteers from churches and individuals being served by Horizon’s sharing smiles. There is a camaraderie and a joyfulness that is generated by serving God’s kingdom. Working shoulder to shoulder and receiving a thank you or a God bless you from a perfect stranger who was hungry and now feels full of both good food and touched by God’s love is powerful. God’s love being made manifest in hands preparing good food, serving it lovingly to others, and cleaning up the mess afterwards is a fitting image of our daily struggle in this world. What has surprised you most about working with Horizons? I love the fact that so many churches in Quincy work cooperatively to support Horizons. We may have different worship styles and traditions, but we share a love of Christ and belief that God wants us to share His love. That also sets a strong example to those being served at Horizons that Christians can and do see past their differences to focus on Christ’s mission in us. What do you with other people knew about Horizons? Horizons is about providing food for the hungry in our community, but I think that promoting a place where respect and gratitude are encouraged by Mark Geissler and those serving in the Soup Kitchen and Food Pantry multiplies the positive effect that Horizons has on all the people it serves and all the lives it touches. What keeps you coming back to volunteer? Every time I serve at Horizons, whether it is washing dishes, serving salad, food prep, or organizing the food pantry, I feel God’s presence. Although I may be physically tired after working at Horizons, I feel recharged, refocused, and renewed. Horizons is life-changing for ALL who come and share in God’s mission in Quincy.